Bred in the carnivorous creative hunger of founder RICHARD K, British Industrial MACHINE ROX provide an irrepressible resistance proof contagion striving to persistently ignite the senses. Since forming in 2007, the band has sculpted a merger of Industrial, EBM Metal and Electro Rock which has rampaged whilst pushing the boundaries of band and genre. It is a rigorous continually evolving exploration marking the band as one hungrily invigorating proposition. 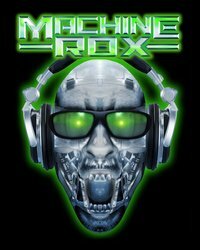 Machine Rox began as the solo project of Richard K, the musician/songwriter taking rich experiences and adventures from being part of industrial metallers MEAT MACHINE and GLOBAL NOISE ATTACK, with whom he shared stages with the likes of Rammstein, Napalm Death, and Covenant, into his new creative intent. The project grew with the addition of AGA in 2010, her unique backing vocals and keyboard seduction aiding a new potency which took the well-received strengths of the band’s first two EPs to new commanding heights with the “Driven” EP. The recruitment of guitarist VALERIAN OPROIU and drummer NUJ FARROW in 2012 saw the quartet concentrating on lighting up the live arena, which they did with acclaim and accomplished devilry through festival appearances and shows which saw them play with bands such as Leaetherstrip, V2A, Deadcell and Deviant UK. 2013 became Machine Rox’s strongest and most successful year to date, the signing with UK label STATIC DISTORTION RECORDS a launch pad for the storming voraciously received “Activate Your Anger “ EP and debut album “Shout”. Both releases exploded with crushing rhythmic invention and anthem breeding ravaging, taking the band’s sound into new imposing yet epidemically captivating depths. A stronger emphasis and adventure into the metal driven imagination of the band emerged within the releases and the recent “Intox” EP, a new toxicity to the ever evolving and refining sound of Machine Rox. Sophomore album “Next Level” unleashed in 2014 and has fuelled the passions with an even greater flavoursome and impacting tempest. A single "Zombie DJ Super Freak" and an EP "Electric Bang Machine" saw the light in 2015 but sadly the departure of VALERIAN OPROIU and AGA. Nevertheless MACHINE ROX is still going stronger and stronger with another EP "Dark is Dark" released in November 2015. With successes including garnering over 600,000 plays and taking the Number 1 slot in the Industrial chart at NumberOneMusic.com, more than 60,000 views on YouTube, and songs "Next Nothing", "Zombie DJ Super Freak" and "Burn in Hell" being featured on the cover mounted CD of Devolution magazine, Machine Rox is proving, as shown by the 8,000 plus and swiftly growing likes on Facebook alone, an unstoppable industrial fire. Expect another EP "Love & Pain" in February 2016!